Alchemy has been explained as chemical recipes to produce gold and as a symbol system of spiritual and psychological truths. Often it has been detached from its teaching, as if it were a purely practical application. In this study, I consider it in another light: as a teaching and as an application (Hermetic-Alchemy): a description of man’s fall from Being and the methods for reunion. Hermetic-Alchemy grows out of the Hermetic Writings, a series of treatises, fragments, and excerpts mainly in the form of dialogues.1 The Hermetic Writings are unsystematic, written apparently by different persons. 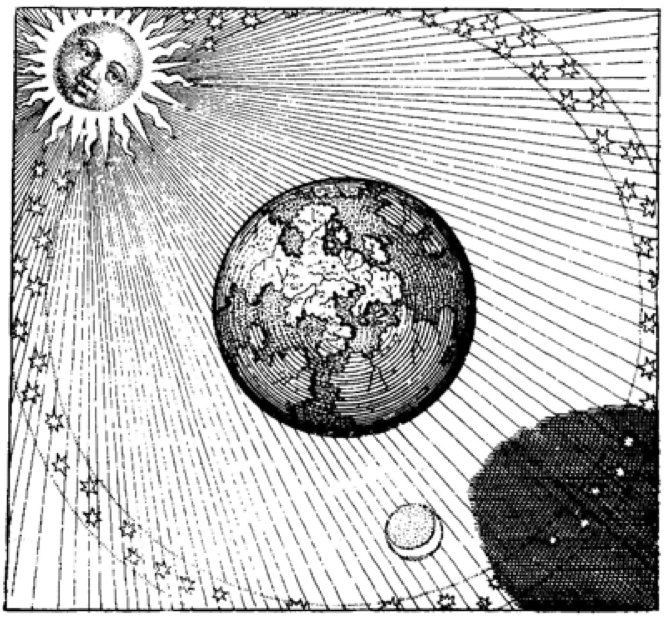 The Alchemical aspect is largely comprised in numerous separate treatises composed down through the centuries. Despite some similarities of terminology, Hermetic-Alchemy, as an esoteric system, presents a different outlook from the three exoteric monotheistic religions: Judaism, Christianity, and Islam. Hermetic-Alchemy presents an alternate view of experience. Sense perception and reasoning do not reveal the true nature of things; once one sees their true order, however, new possibilities open, since one knows the true laws. The true order is basically the occult (that is hidden) world, the non-material realm of mind and its laws which allow one to function differently. By what is called transmutation, one seeks to reach the other eternal realm, from which all things come. The imperfect, constantly changing physical universe must come from a higher source which is changless and perfect, since the change implies stability. Thus, Reality is a hierarchy from an overflow, or emanation, of the Supreme Source, the One, the Good, out of modifications in its own nature, but which remains transcendent. From it comes the various gods, the Divine Mind (Being; the Platonic Ideas, the eternal essences or Forms of all things; the Intelligible, or Supernal, Realm), then Soul (the Principle of Life), and finally the bodily and material, universe, which reflects the Forms of the Divine Mind and Soul in Matter. Matter is the indeterminate and fluctuating; and thus there is imperfection, flux, the indeterminate, and evil in the Physical Universe. Reality, then, is like a pyramid: at the apex there is unity of thought and being; there there is no time, space, or Matter, no exteriority; but in the descent into lower planes thought and being become separate; until on the lowest level, the physical universe, there is not only separation but disjunction. The Hermetic Writings do not teach that this was an event in the distant past, but rather a perpetual, eternal creation that always occurs. Thus, the visible universe is a manifestation of the invisible in space, and time, and Matter. As a result, there’s an imperfect natural order and a perfect transnatural one. Matter, the invisible principle causing imperfection, negation, the indeterminate, and evil, is not to be confused with body: Body and the visible universe are composed of Forms, or essences, reflected in Matter. Body and the visible universe are good; but their imperfection arises from the presence of Matter. The Soul mediates between immaterial realities of the Divine Mind and the Physical Universe of imperfection, flux, and indeterminate change. Looking upward, it receives the divine Ideas; looking downward it circulates them in the Physical Universe. The individual soul is a part of Soul. It contains latently all the perfect immaterial ideas. But, it falls to the lower plane, becoming wrapped increasingly in materializing envelopes, which cause it to forget its true origin and the true structure of things. It nonetheless seeks the good, the apex of the pyramid, the union of thought and being; but it accepts as real the material universe and being locked into its separations and disjunctions, its distractions, indeterminateness, and constant change. Thus, it can become contaminated and require regeneration. We read in the Six Keys of Eudoxus: “…The philosophers [that is, alchemists do designedly speak in equivocal terms, to the end that those who have not the lynx’s eyes may pursue wrong, and be lost in this labyrinth, from whence it is very hard to get out…for it is a truth, that in each work the wise Artist ought to dissolve the body with the spirit; he must cut off the Raven’s head; whiten the Black, and vivify the White.”6 This makes it clear that Alchemy is a symbolic statement of Hermeticism as well as an opening to the non-material world. The practice of alchemy is not a literal practical experiment, nor even a symbolic statement which is to be translated by us into rational, moral, or spiritual understanding. It is intended actually to arouse us into sympathetic rapport with the higher realm. It is sympathy and resonance, reached by the mind, or soul, not by sense perception or ordinary reasoning based on sense perception. Once we grasp this, the alchemical recipes can perform their proper function on us. They arouse and place us en rapport with the higher elements of the Supernal, producing inner and outer effects. Their aim is to produce this rapport, not to provide literal or symbolic directions. All things meditate, or on a milder level, contemplate. All things, people, and actions are truly what they insofar as they are linked with their non-material Forms, the true reality. Thus, their being derives from contemplation-meditation. The alchemist seeks to return and employ that higher realm for his own development and for his control over nature. External activity, though necessary, is a falling off from the Forms. Man must lead himself back to the essences of things and even reach the divine realm he has fallen away from. But this insight is difficult for modern man to accept. As a result, a true understanding of Hermetic-Alchemy is closed to him, unless he can grasp this reversal from sense-perception and ordinary reasoning into the understanding that the outward world is really an effect of the inner world, a manifestation of the Ideas, Forms, or Essences. Hermetic-Alchemy is a method, stated symbolically in the texts,7 which are intended to produce an altered state of consciousness, the meditative state, so that the alchemist becomes able to use suggestion, affirmation, visualizations to change himself and the nature of his experience and circumstances. The human being is a magnet in contact with the Great Magnet. Since the Supernal Realm is the realm of unchanging, eternal perfection, reaching it through suggestion, affirmation, visualizations has a healing, correcting, perfecting effect on the material sphere. The natural is irradiated by the transnatural. Hermetic-Alchemy teaches that the alchemist can so develop this ability that his life becomes transmuted. Ordinarily, in our fallen state, we think of life as imprisoned in matter; we all have subjective selves cast adrift in a universe of blind, material forces. Hermetic-Alchemy, however, teaches that, while this is the nature of the Physical Universe, it is only the lowest plane. Intelligence (Mind, the Forms, or essences) exists through-out the universe, and Soul circulates its patterns, bringing life, supplying, repairing, and renewing. Alchemy seeks to reach this insight and power. Since sense perception and ordinary reasoning could not access this alternate reality, another method was necessary: The right technique was altering consciousness adequately to reach the above (or the inner), the higher levels, which were the true, causal sources for things below (Or the outer). The human being can, through contemplation-meditation, come into contact with, explore, and influence this realm: thus achieving the goals of Hermetic-Alchemy: all-knowledge (the philosopher’s stone), unity of being (the rebis), the transfonnative ability (the elixir), wealth (the gold), and ageless youth and health (the panacea). Contemplation-Meditation, with its various levels, can bring about internal results, at other times external ones. Such access was possible to the degree the person makes himself or herself receptive (passes beyond his or her fallen state, which is different in all persons) to the true teaching and method of thinking and practice, achievable through suggestion, affirmation, and visualizations. The alchemist is dealing with the ability to turn away from ordinary consciousness to the consciousness of higher realms: astral travel, lucid dreaming, union with the Supernal Powers, and magical effects both internally and externally. One must achieve a purification and turning-away from the falsities of empirical consciousness into higher identifications. Hermetic-Alchemy describes the magico-mystical view of the nature of things. Transmutation is a distinctive term for Hermetic-Alchemy. Transmutation is seen throughout nature, which seeks to realize the transnatural Forms, but cannot because of Matter, although the human being can, even while he participates in nature. Beyond the transmutations that occur naturally, there are transmutations which man brings about on various levels, his practical activities, his arts, and sciences are all man’s transmutations which go beyond those in nature and which are based on his grasp of principles and ideas. Transmutation is not an infinite movement, but one that realizes the intrinsic essence. In nature, we see this, for example, in the assimilation of food: one can eat vegetables, chicken, fish, etc., and the processes of digestion take over and transmute the materials into human flesh: no one who ate fish exclusively ever turned into a fish. Similarly , the seed planted in the ground, decays in order for the sprout of growth to appear; further, the protoplasmic part of the egg feeds on the yolk in order to grow, after which the chick peeks itself out of the shell. But what is realized only on the natural level will dissolve again. A yet higher reach for transmutation can be seen in the making of liquors. The fermentation and distilling process results in an energizing, volatile, stimulating, and relatively unchanging, substance: the alcoholic beverage. It was a refinement of the material, and its volatility made it called ‘spirits’ and so analogized. Thus, this process was seen as producing the essence of the fruit and analogous to the Spiritual Realm itself. It was seen as a movement from the material to the immaterial, to the essence; “spirits” was yet higher than the purely natural and pointed to the transnatural, higher realm. Probably, all cultures have some sort of spiritous distillation into essence. Like the making of spirits, other transmutations which human beings bring about, such as in the arts and sciences point more fully to the higher realm. The practical tends be within the processes of nature, such as building, making objects, etc. But the arts and sciences, while they too are subject to time and space, nonetheless escape to some degree. The work of art and the scientific formulation seem to be on a higher level and, therefore, in closer contact with the transnatural realm, the realm of Ideas. Further, they are generally made of less corporeal materials: the musical composition, the poem, the scientific explanation to some greater degree appear to be elevated above the material. They are more fully en rapport with the Realm of Ideas, Forms, or Essences. Such transmutations are not exactly beyond nature, but somehow higher than it. Thus, there are transmutative processes in the natural world of time, space, and Matter; and some apparently beyond it. The latter are in contact with subtle, more refined worlds, which are just as real as the material world; but they are perceived more through aspects of the mind or soul, not through mere sense perception or ordinary reasoning. A symphony, a painting, a well-formulated scientific theory, for example, introduce us into a subtle realm beyond; they place us en rapport with a higher world. A kind of subtle body and matter compose that world and, in the human being, gives rise to his subtle perceptions of them. These other worlds are like dreams, when taken seriously, which represent time, space, and matter, but obviously arc not bound to them; Farther on lie other worlds, yet more refined than dreams. They are in part subjective, but in part objective: thus we must separate, the gross from the subtle. Through special alterations of consciousness, man can communicate with them and in them, since he can be in contact with them. Thus, transmutation culminates in a transnatural reality, by which man can communicate with the supernal world. In this practice the knowledge of any Form, or essence, can put one en rapport with a supernal substance. When adequately prepared, the alchemist can rise to the true realm, which generates the visible one. Thus, his natural and transnatural worlds are interlocked and interact. All things, natural and transnatural, are one Whole, an All, which is alive; all its parts have life and purpose. In the material world concealed within the material husk, the Essence can be drawn out, just as the chick emerges from the egg, spiritous liquor from the fermentation of vegetation, humans make things, and finally can come a direct contact with the other world. All things in nature and in the human world are seeking, then, the good, the perfect and the eternal. Transmutation, then, is a fact of nature, which seeks to move to the transnatural. The question becomes: how can the individual bring about transmutative changes within his own experience, inner and outer, regenerate himself to the apex of the pyramid, where thought and being are one and of which one has a reminiscence, since one recalls unconsciously one’s original unfallen state. To resecure it is the Hermetic-Alchemical task. All things in this world are copies of the paradigms in the higher world; thus, all things not only seek the higher by transmutation, but become symbols of it. Symbols, as pointers to the transnatural, play a vital role in Hermetic-Alchemy. All things, especially the elements, the planets, and the metals have immaterial powers or principles associated with them, are indeed in some sense alive. Human beings are composed of salt (body), mercury (quicksilver; soul), and sulfur (spirit). First must be applied the acids, which decompose the fixities of the personality of the particular person, produces the “chaos,” and recoagulate them so he can see the processes in nature and beyond. Earth, Water, Air, Fire, and Ether (in many systems) in constant flux in the material world, nonetheless can indicate the movement from the material (Earth) through passion and intellectual Activity (Water and Air) to illumination (Fire), and finally to the insight into the higher realm of Forms (Ether). All the elements are still, however, within the processes of the natural, material realm. But the seven metals, associated with the seven planets, symbolize the movement of the individual soul beyond the elements into the transnatural, a fuller transmutation. Silver (the Moon), Quicksilver (Mercury), and Copper (Venus), all indicate the development away from the purely corporeal passions to higher emotions, capable of a higher sublimation, such as to Love; Gold (the Sun) indicates insight; Iron (Mars), Tin (Jupiter), and Lead (Saturn) indicate the movement yet higher into intellectual understanding of the higher world. All these processes occur differently in different people depending on their natures and receptivity. But all move finally to the stars, which represents the same: the True. the Beautiful, and the Good. Thus, all things, below (on Earth) and above (in the Heavens), as well as man himself, have spiritual powers and meanings. It is important to bear in mind that the real significance of symbols, is not to produce intellectual understanding, but rather to stimulate, inspire, reveal, and evoke through them and their associations the various natural and transnatural powers. Thus, a person can bring into his experience what is operating in them and in himself, which means he can gain transmutative controls over his world. These symbols and their associations function metaphysically to restore the individual to the eternal structure of Being, from which he has fallen and wanders. They can produce the desired transmutations when the right contacts with the Forms of reality occur. Symbols, which stand for the spirits of the substances, control them through man’s mind or soul, which contains them latently, and thus can come into contact with their supernal natures. The symbols in the texts of Hermetic-Alchemy are not static, but dynamic; and through it the inner transmutative process moves. The symbol is in sympathetic correspondence with the Supernal Realm: it is both below and above, material and immaterial, and thus can redirect our being from energy to spirit, clarify the levels of the mind, and unveil the levels above (or beneath and within). Ordinarily we live and think in the separations of time, space, and matter: our thought and our being are separate. We are at the bottom of the pyramid of reality. But there are times of intuition, of union, identity, rapture, and synthesis. We reach the apex. Then we no longer feel that separation between thought and being; we are one; our thought becomes insightful and illumined; we are en rapport. This is the goal of Hermetic-Alchemy, which takes these ordinarily intermittent, even momentary, states as reflecting the ultimate nature of things and able to transmute it. The gold, the rebis, the philosopher’s stone, the elixir, the panacea are different symbols for this unity and good of being, wherein our original perfect status, from which we wandered into the material separations, is realized again. As a result, we are no longer distracted from the true order of things into the wanderings, improper mixtures, and separations of physical life. We are able to reattain the powers of the unity of thought and being. It is clear that what the alchemist works on to reach the stone, gold, rebis, elixir, and panacea is on himself as microcosm. A central symbol here is the athenor, the furnace, the alembic. The alembic, or athenor, is the alchemist himself; for the transmutative process produces a new person with extended powers. What, then, is worked on in the furnace? The body, with its sensations, merely sense-oriented values, irrational passions and weaknesses, and ordinary reasoning, which can never overcome the separations and disjunctions of natural existence, are transmuted into the realization of the highest intuitions: the Essences. The alchemist journeys into the inner realm and comes back with treasure. It is clear, however, that in this symbolism, it is not necessarily a matter of escaping from the material world into an asceticism, but rather purging one’s fallen and false nature and identifications, so that one’s inner transcendence becomes apparent and part of oneself. It is a process of opening up to the larger reality and purging the distractions for a union with the original divine powers within. Thus, the alchemist obtains his intrinsic, microcosmic powers. He creates things out of the ultimate from which all things come. The alchemical achievement in Hermetic-Alchemy is the power of the alchemist to change things within and without, as he wills, through the contemplative-meditative means of placing himself en rapport with the higher realities and their power to transmute the lower ones. The application of alchemical realization is expressed as the tincture which is projected and multiplied, which can color all things. A tincture, in this context, is not only something which colors something else, but is also able to infuse and imbue things. Thus, the tincture is the fundamental power of the Hermetic-Alchemical goal. It can color, transmute, and affect all things and circumstances; this is its projection and multiplication. The alchemist takes his realized transmutation, which is in the mind or soul, and projects it upon material things to tincture them with the highest intuitions and realizations. This involves multiplication, since some things can be dispensed variously from a single source: one flame can make several; love can include many not just one. This is the alchemist ‘s higher power. Thus, the mind of the alchemist has changed himself and can change outward things. Hermetic-Alchemy has opened to him the Supernal Realm to which he can travel and its different mode of causation, the power of the Forms to shape and influence the nature of things. Thus all things become transmutable in the natural and the transnatural. The object of Hermetic-Alchemy is transmutations by the mind’s own inexhaustible resources, working under the stimulus of sense perception and the guidance of the higher Mind. For the alchemist, as microcosm, his mind, or soul, is not a blank tablet, but contains latently and occultly all the Forms. He mediates between sense perception and the Forms in the Divine Mind. The human mind, or soul, is endlessly capable of transmuting, to one degree or another, all the ideas and worlds it encounters. Its latent Forms unfold as a result of sense perception or the exploration within of its ideas; thus, it can guide and control on all levels of Being. This is its realized power of tincture. Modern man finds it difficult really to understand Hemetic-Alchemy because he is caught up in process philosophy, the idea that everything is constantly changing; in the view that only matter really exists, that sense perception and ordinary reasoning are the only ways to understand things, in empirical scientific technology, and hyper-activity. In these perspectives contemplation and meditation are inferior modes. He does not accept anything beyond the visible and tangible; he does not believe in a non-material causative realm of Forms, spirits, and powers. Hermetic-Alchemy teaches the contrary: a new reality and a new kind of causation. The alchemists learned many centuries ago that there exist two minds: one thinks in terms of reason and logic; but the other thinks in terms of associations, affirmation, and suggestion. These two minds look out on two different worlds, but which constituted one reality. They expressed this understanding in the Hermetic philosophy and emphasized its practical applications in Alchemy. These are expressed in highly philosophical terms and obscure symbolism so that their true importance is liable to be lost on the modern reader. But this was the result of the ancients thinking in transcendent terms, rather than in an ordinary manner. The human being is on the lower physical plane, but must not accept it as final, as the whole of reality. We have fallen into imperfection, but not altogether; we are still in touch with our original selves which inhabited the higher perfect realm. We can elevate to the higher plane where we are one with the true structure of things, with true causation. We do this through understanding the true nature of things and through contemplation-meditation: we can thus change ourselves, others, and circumstances, to the degree of receptivity. There is a rapport, a sympathy, a correspondence, a reverberation, a congruence of like-to-like, between the two realms, for all things in the lower do not wander entirely, but remain participatory on a higher level. This rapport is mediated by mind, or soul. The human mind, although linked to the higher becomes distracted into the negativities of the lower material realm, for Matter, indeterminate and ever-flowing, gives rise to evil. Thus, man can build a false mind, losing the influx from above. But the human mind can regain its original status and restore the influx, coming to know again the supernal realm, thus achieving a new unity from the scattered fallen status. This is the goal of the transmutative procedure: to achieve the rapport which transforms. The obscurity of the alchemical texts is precisely the hermetic secret. These baroque and extravagant recipe books are not to be read literally or symbolically: they do not refer to actual chemicals or even to spirituality or psychology under strange symbolic terms. They are intended, when contemplated and meditated on, to jar the consciousness of the reader out of the routine and expected and to invoke within him a sense of the higher realm and its perfective powers, which in itself will subtly transmute him and put him in the presence of the ultimate powers: The practice of Hermetic-Alchemy is not a literal practical experiment, nor even a symbolic statement which is to be translated by us, but to resound and awaken in us the rapport. Through contemplation-meditation, the person can link with the supernal powers and wield its powers to a greater or lesser degree. Mind or soul is all. The realized alchemist stands beyond, though not above, society, institutions, and customs; he is autarke, self-ruling; he has reached the total universal and practices linkage with the essences of which the material is merely a copy. Even if he gives in to circumstances and necessities, it is with full discernment. The alchemist is the totally liberated, but knows how to practice it in the context he is living in. The alchemist is a magician, a theurgist, and a mystic. This is the true Hermetic-Alchemy, which gave rise to its being called ‘spagyric,’ which means separative. It requires separating the gross from the subtle; the detachment from the sense world and one’s fallen nature and the union with the higher mind. The aim is to enter into the higher consciousness, where it can enact the transmutations desired by means of suggestions, affirmations, and visualizations. Thus, the alchemist accomplishes the practical side of the hermetic doctrine by contemplation-meditation on the eternal structure of Being, influencing the subtler factors inwardly and outwardly. It is the magico-mystical view of the nature of things. 1. Various editions of the Hermetic Writings are available: the Wizard edition, The Pymander of Hermes and The Virgin of the World, 2 volumes; the Walter Scott edition. Hermetica, 4 volumes; Shambhala; and the G. R. S. Mead edition Thrice Greatest Hermes complete in one volume: Weiser. 2. That the Hermetic Writings express a type of Platonism, see Walter Scott, Hermetica, Volume I, p. 9. 3. That the Hermetic Writings are not Christian (despite similarities in terminology) and do not refer to a Savior, see Scott, Hermetica Volume I, pp.12f. 4. My discussion of the Hermetic Writings presents its ideas systematically and with more consistent terminology. That the Hermetic Writings are often metaphorical, unsystematic, even contradictory, is widely observed A . H. Armstrong calls them incoherent; see his translation of Plotinus’ Enneads. Volume I, xivf., (Cambridge: Harvard University Press, 1989). For the emanation of all things from the One, the Supreme Source, as opposed to the Judaeo-Christian idea of a “creation” out of nothing and in a moment of time, see Book III. The term “God” and the “will of God,” do not mean the same as “God” and his “Will” in the Judaeo-Christian-Islamic sense; see Book IV. Nor does the term “Son” mean what it means in Christianity. In the Hermetic Writings the non-material (spiritual) and material worlds are an eternal, unwilled emanation from the One, unlike the”creationist” views of the three monotheistic religions; in this the Hermetic Writings reflect pagan Platonism. For the idea that the One is Good and for ideas of divine vision and silence, see Book IV. “God,” or the One, emanates first the gods, who give rise to the various species of things on Earth; see Book III. For the descent of the soul, which takes on wrappings of materiality, see Book II; for the fall of the individual soul being caused by a fascination with the physical universe, see Book III; For the equation of mind and soul in human beings, see Book IX. For the planes of emanation from the Supreme Source (which the Hermetic Writings call “God:”), Divine Mind, Soul, and the Physical Universe, see Book III For the idea that man can regenerate, by turning from the sense world and his wrappings, see Books VII, VII, & IX; for the view that all things in the material world are related to the non-material world and that man can relink with the Supernal Realm through contemplation-meditation and affirmations, experiencing astral travel and identifications with the divine, see Book X. For the idea that spirits influence things in the visible universe, see Volume II, pp. 101-106; for the idea all things are basically in harmony, see Volume II, pp. 108-109. 6. Mrs. Mary Anne Atwood’s A Suggestive Inquiry into the Hermetic Mystery includes the Emerald Tablet, the Seven Golden Chapters, and the Six Keys of Eudoxus; rpt.Yogi Publication Society, p, 500. 7. For a selection of alchemical treatises in the typical cryptic symbolism (of late composition), see A. E. Waite. The Hermetic Museum, rpt. Weiser.